Black tea is a dark tea that has more oxidation than other teas. Because it’s strong, it’s often mixed with other teas in order to reap the caffeine and antioxidants benefits without being overwhelmed by the strong flavor. Learn more about this popular tea, how to prepare it, store it the benefits, uses and more! Black tea is made using the stems and leaves of the Camellia Sinesis shrub. While green tea is made from the fresh parts of this shrub, the black version is made from aged parts of the shrub, which assists greatly in allowing this particular form of tea to last in storage for years rather than days or weeks. Black tea is prepared like most teas, with the exception that it offers the most medicinal qualities if the water is heated to almost boiling rather than to the actual boiling point. The leaves (or bag) should be steeped for 3-5 minutes, depending on how strong you like the flavor to be. Though some tend to over-steep the tea in an effort to increase its medicinal effects, this is not an effective option. If you wish to increase the medicinal effects of it, simply use more leaves or tea bags. Keep in mind that black tea is well-known for its caffeine content and this is something you might want to take into consideration when deciding on the strength of the tea you wish to use. It is not unusual for black tea drinkers to combine it with other teas. Many people drink it in place of coffee, using additives such as cream and sugar. You might also try adding lemon or honey to this tea to make it more palatable. However, do not try to add lemon if you have already added milk. The results might turn you away from tea forever! You can also use black tea to make kombucha. Click here to see how easy it is to make your own kombucha. Black tea can be stored like any other tea, in a cool dry place. The main difference in the storage of black tea and others is that black tea can be stored for years without losing any of its medicinal potency. Many people buy large quantities of black tea and combine the tea with others to enhance some of the medicinal qualities or to season to taste. 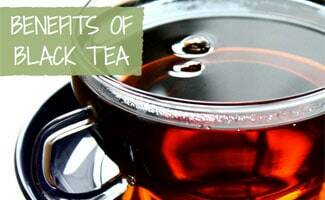 The benefits of black tea are many. Let’s review a few that may prove helpful in your life and health. Black tea is often used in the morning or afternoon. Generally, it is not used in the evenings due to the caffeine content of the tea. Feel free to use this tea for its medicinal properties, but be sure to consult your physician and make them aware that you are using it. The high caffeine content of the tea may cause an unpleasant interaction with certain medications. You should also avoid this tea if you have caffeine allergies or if caffeine causes you undo anxiety. The natural caffeine properties of the tea may assist with learning, the processing of information, enhancing the memory and increased mental alertness. It can be used to treat headaches, low blood pressure, stomach upset in the form of nausea and vomiting, diarrhea, various stomach disorders and may even be helpful to those with type 2 diabetes, though studies concerning type 2 diabetes and black tea have been largely inconclusive. It is probable that any assistance with type 2 diabetes is due to the diuretic effect of black tea, which causes an increase in urination, thereby helping to detoxify the body in general. Black tea is sometimes used to reduce the risk of certain cancers for those who may be in a high risk group. The exact reasons are unknown, but in general, a healthy diet can often decrease the risk of cancer. Organic black tea uses no chemicals and has no need for the processing that some foods require in order to be preserved. Black tea can help reduce the risk of cancers including ovarian cancer, colon cancer, lung cancer, stomach cancer and breast cancer. Black tea is also thought to reduce the risk of Parkinson’s disease. In some cases, it is used to prevent simple medical issues. It can be used to prevent tooth decay and kidney stones. Since black tea does have so many medicinal qualities to it, there is no harm in using it for these purposes as well, but you may want to develop some understanding of why black tea might be helpful in preventing tooth decay and kidney stones. Tooth decay is often caused by the consumption of unhealthy drinks such as sodas. When sodas are replaced with black tea, you obviously reduce the risk of tooth decay. An increase in urination causes thirst. If you drink healthy drinks, then an increase in thirst means an increase in healthy liquid intake, which naturally helps in the breakdown or prevention of kidney stones. When you drink large quantities of healthy liquids, you increase the saliva flow in your mouth, which essentially causes your mouth to “flush” itself, removing harmful bacteria. In short, the more healthy liquids you consume, the healthier your body is going to be in every way. With that being said, black tea can be used as a supplement in your health routine, but avoid drinking too much to limit your caffeine consumption. Seeking more benefits beyond the highlights that we covered here? This video showcases lots of uses and advantages that might add to your sipping enjoyment! Do you drink black tea instead of coffee? Whatever you like to call them, juice ‘cleanses’ or ‘detoxes’ have taken the dieting industry by storm. In exchange for a diet that’s heavy on ‘healthy’ juice, we’re promised healthy, young, radiant skin, potential weight loss and an improved clarity of mind. That is what healthy juice provides us. That’s pretty amazing that black tea can reduce cancer risks. It’s interesting how our bodies react to healthy drinks as you explained. I get bored just drinking water to be healthy, so flavorful alternatives like tea sound like a great option.